Major exploratory associates Christine Blank and Matthew Deffendall. LEXINGTON, Ky. (Oct. 17, 2018) — Educational and career decisions are some of the most important decisions we make in our lifetime, and choosing a major is no exception. 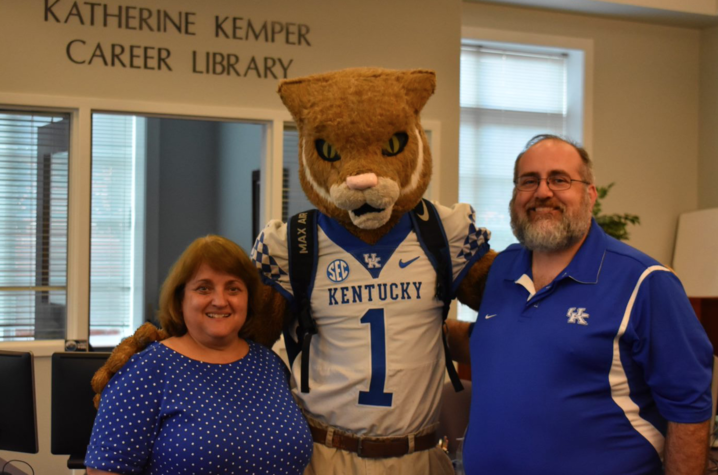 Exploratory students at the University of Kentucky now have new resources available to assist them in taking the first step in choosing a major. To help begin the conversation, the Stuckert Career Center has employed two major exploratory associates — Christine Blank and Matthew Deffendall — who can meet with exploratory students. With a vision to empower students to achieve career aspirations, the Stuckert Career Center prepares students for a lifetime of career possibilities through an educational journey that fosters engagement, reflection and holistic development. Major exploratory associates are the first point of contact at the Stuckert Career Center when helping students in the career decision making process. According to the U.S. Department of Education, nationally, one third of undergraduate students will change their major at least once within three years of enrollment. Exploratory students generally fall into one of three categories. First, there are students who have not chosen a major nor an occupational choice. Second, some students know their occupational choice (doctor, lawyer, engineer or business), but are still exploring major options. Finally, the third type of exploratory student has narrowed their major choices but has not decided yet. In addition, sometimes students start in a major and decide to explore other options. When students meet with a major exploratory associate, they will talk about their values, interests and if necessary complete a career assessment to assess their personality. Students then can follow up with a career advisor to review the assessment and discuss their career goals. Whether a student is exploring majors or considering a change, the Stuckert Career Center can help students navigate the process. Students can meet with a major exploratory associate by scheduling an appointment online via Handshake or stopping by the center's drop-in hours noon-4 p.m. Monday-Thursday. The Stuckert Career Center, located at 408 Rose St., is a part of Student and Academic Support in the Division of Student and Academic Life.